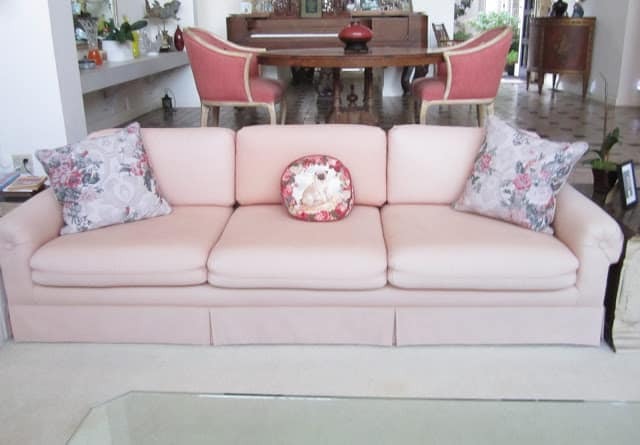 to reuse upholstered furniture that you already have. Our dining room furniture was slipcovered about eight years ago and has seen plenty of use. change the rusty self fabric buttons. These will probably be back next summer. a more simplified slip in a washed pale oatmeal cotton linen. giant investment as I purchased all the fabric a discount outlet. I love black and white French ticking and was able to incorporate some on the welting. with different colored table linens. My client, the mother of a friend of mine, likes a classic more formal look in her living room. We splurged on the heavier lampas fabric, made in Italy by Kravet Couture. and branch motif is more to my taste. Since there are two nine foot couches that required 52 yards of fabric, I searched for a luxurious but inexpensively priced material. The herringbone cotton/silk blend was only $15/yard. Notice how we updated the sofa’s arm? The owner has a beloved pug and her daughter made the needle point pillows for her. elegance and comfort have to go hand in hand and I like sofas you can nap on! with the homeowner’s plethora of accessories. 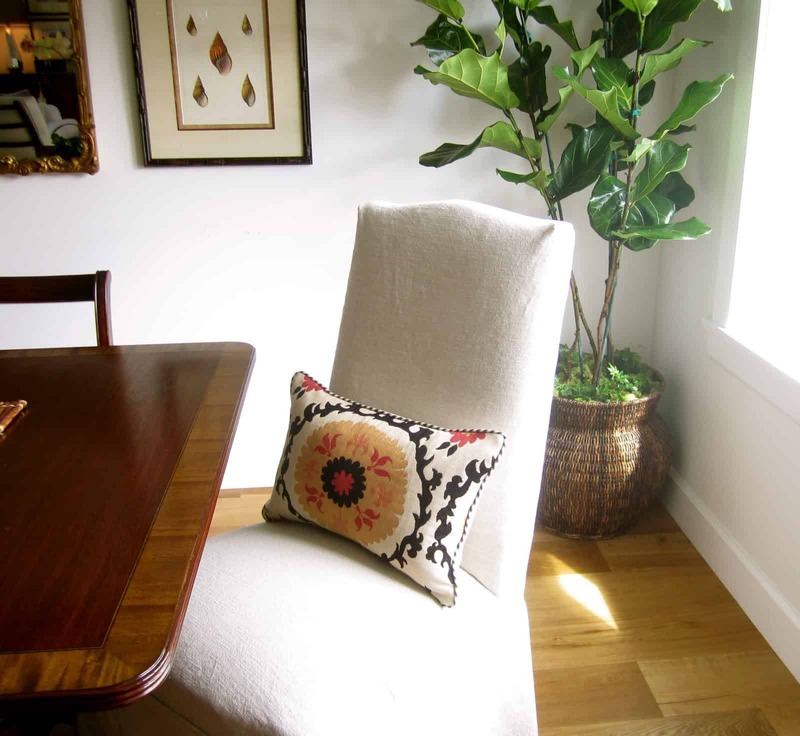 Have you considered reupholstering, or even adding new pillows to refresh your look? Hi Mary Ann, 52 yards of fabric, oh my! The end result was wonderful The arm looks much better. Isn't it amazing that one little detail can make so much difference. Thank you for your post the other day. Are you back from Mammoth? Love the new look in your dining room! Hi Mary Ann! A great collection of before & afters. I just love the timber-framed armchair. What a makeover! Love the Suzani fabric! Isn't it great when you can make an easy, fairly inexpensive and fun change like that, that doesn't have to be forever? Good job! I am impressed, with everything!! Your dining room is FABULOUS. Love the Suzani fabric, its so fresh and crisp and its amazing how it changes the feeling of the space. Ditto the two chairs and sofas, they looks so fresh and elegant now…WELL DONE!!!! Great fabric with wonderful results……..can't believe the price of the fabric! Beautiful. I love to see what people are doing with furniture – so inspiring. Looks wonderful, the suzani is perfect for those chairs! It just gives it a freshened up look! 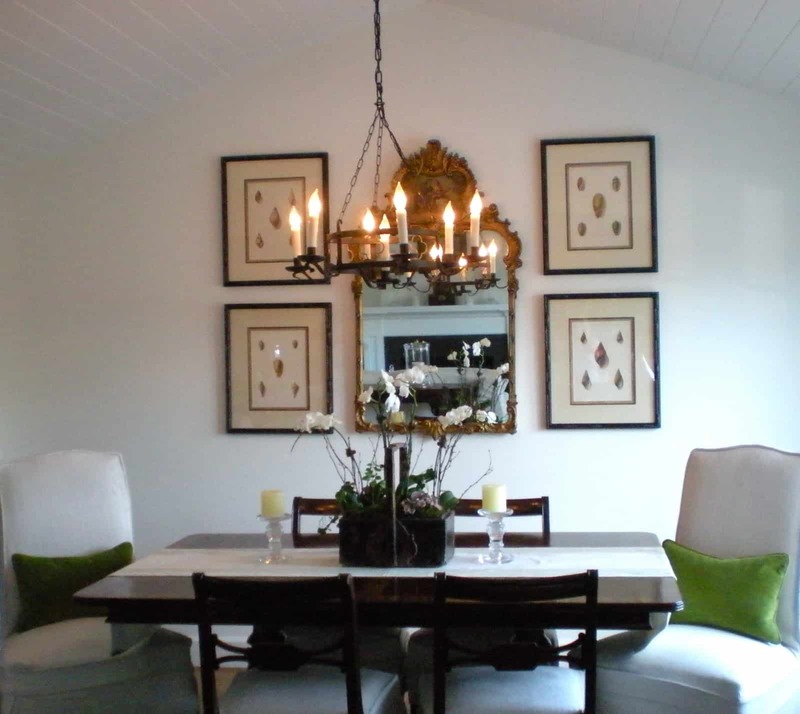 I love your dining room, Mary Ann, and the changes you've made to your client's living room. I'm looking forward to seeing it completely refreshed. I owe you a big thank you. I ordered the Pottery Barn quilt after seeing it in your master bedroom, and I LOVE it. 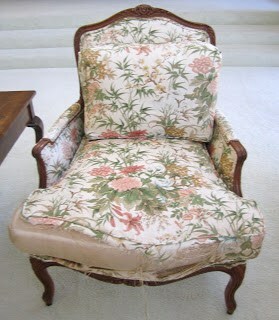 I paired it with a French ticking (like you, I love ticking, too) dust ruffle in neutral colors from Country Curtains. The room is calm and serene and monochromatic, just like I wanted. 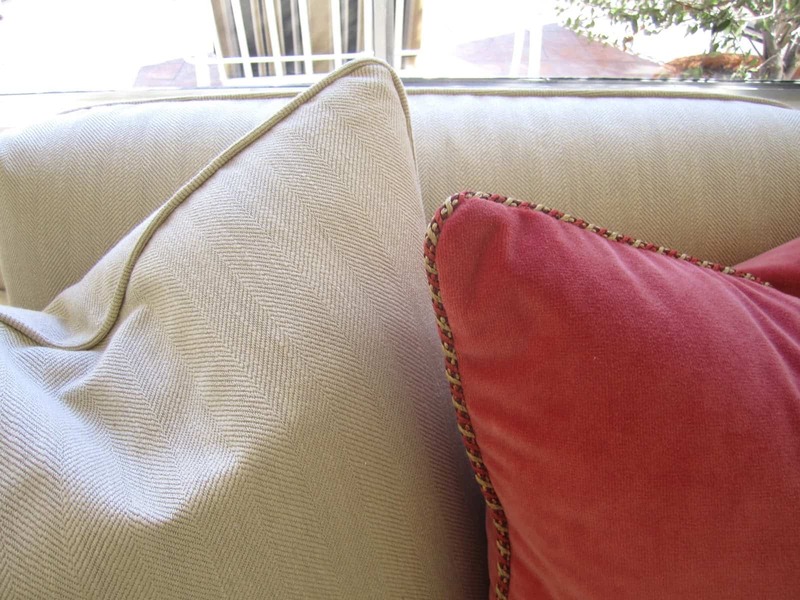 I am adding a pop of color with some Euro pillows with custom shams in our colors. Thank you, thank you. I had looked for months for the right quilt, and wasn't sure about the one from PB till I saw it on your blog. I have reupholstered dining room chairs but never a big undertaking like that chair or couch. I didn't even know you could change the arm style of a piece with upholstering!! Crazy. 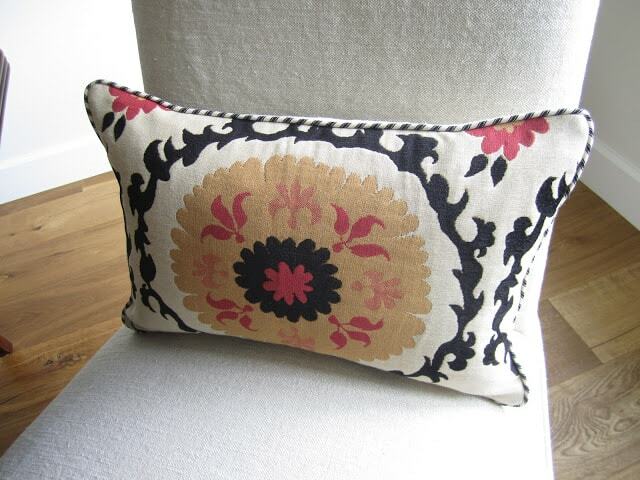 Love the suzani fabric you chose – so pretty. 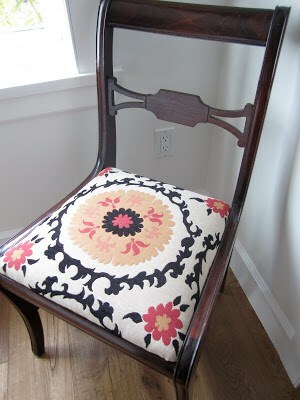 I love the suzani fabric you added to your chairs! Some might say it's trendy, but I love it too! 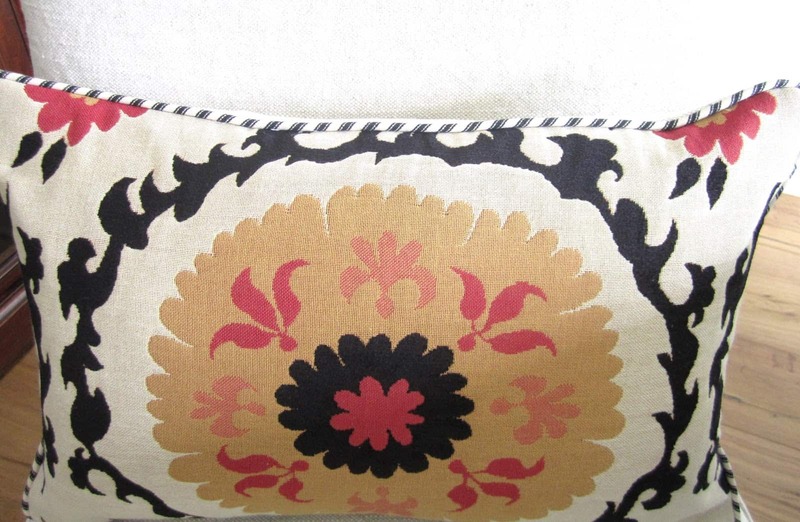 I just recently had some pillows made in a suzani print, and I love it! It might end up being one of those fabrics that becomes a classic. 🙂 Great job on the upholstery choice for the sofa! What a great transformation. Beautiful, Mary Ann! I love the fabrics you chose. You really scored on the sofa fabric. I really love the suzani fabric that you chose – especially with the linen backing and the ticking trim – it's a great look. OK, that Suzani fabric is the bomb!! I never would have thought to pipe it in that ticking, but it totally works. Such a current and hip look for that space. very jealous!! M.
Would you mind sharing the sources of your fabric? I love the herringbone and Suzani fabrics! Your dining room is still one of my favorites. Love the updates! Great post – I TOTALLY believe in this. 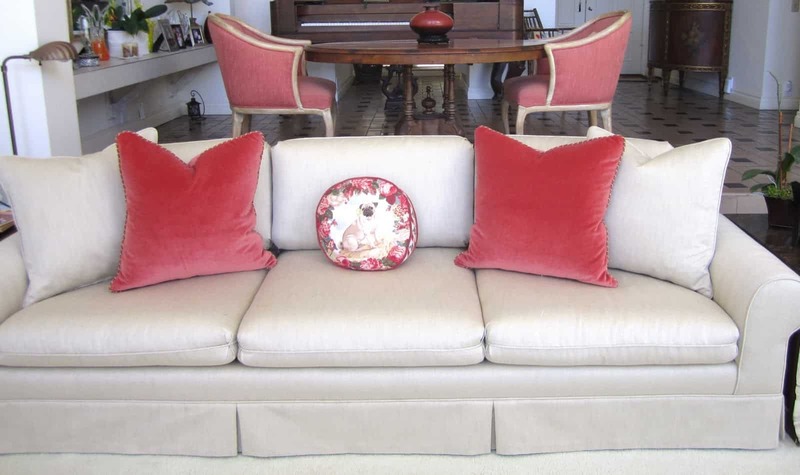 So many pieces of furniture can be reborn with new upholstery or a fresh coat of paint. 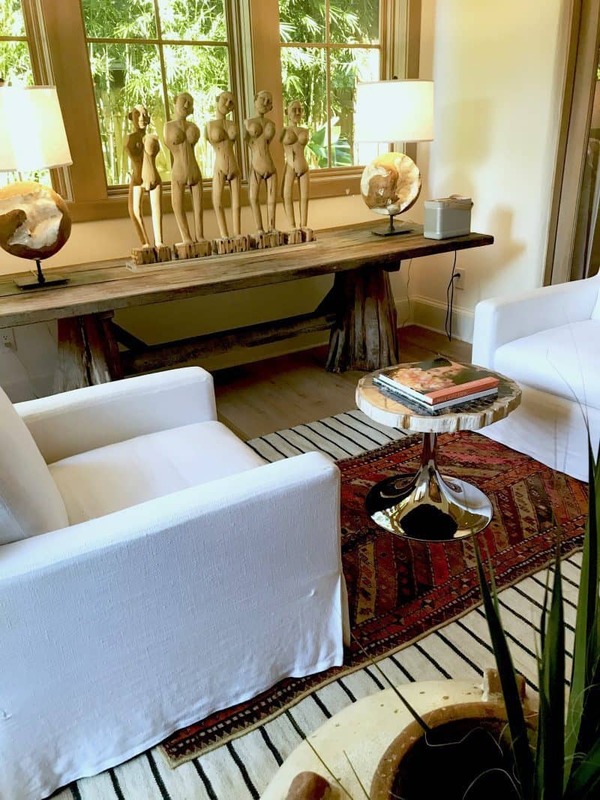 When I was invited to go to the governor's residence to cover the renovation there, I was so impressed that one of the designers, Catherine Cleare, found all of her pieces in the basement of the house and repurposed them – they look absolutely fabulous and what a cost saving and eco friendly move!! It is amazing how much a new fabric can change the feeling of a space. The before and after both look terrific! I'm a big fan of reupholstering a solid piece. No point in sending something to the landfill that has plenty of life left in it. I've done my dining chairs and a loveseat in my bedroom. Great idea smoothing out the arms for an updated look! Thanks for sharing. That sofa fabric is gorgeous & I love the suzani. 52 yards of fabric? whoa, good thing you found a good deal. Love it! I love all of the new fabrics!! Maryan, you did such a great job, I love the pop of color of the pillows and how the Suzani fabric brings life tot he whole space. I agree with you re-upholstering old furniture gives it a entire new life. Everything is gorgeous! Who cares about trendy! All that matters is that YOU love it! 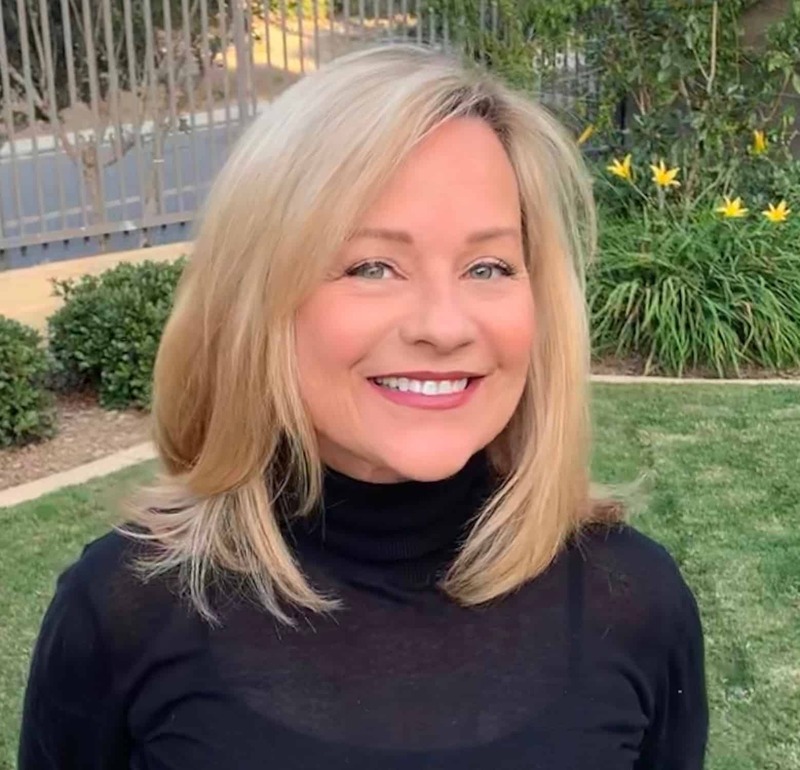 Gorgeous update, Mary Ann! My philosophy is, if you get on the trend quickly you'll probably be tired of them by the time it's on its way out! 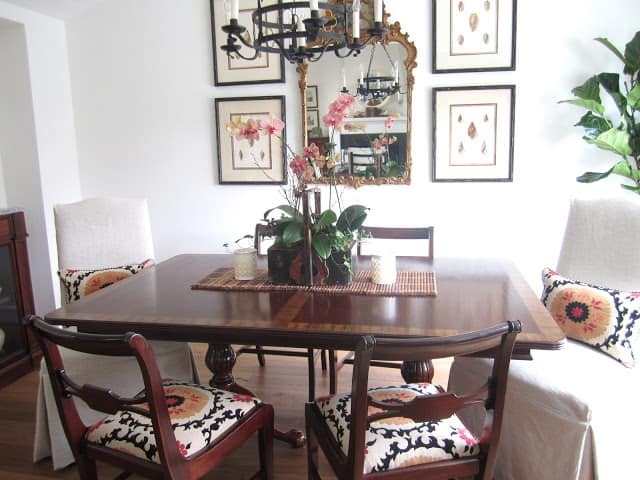 The suzani is beautiful in your dining room. Hi everyone, The 52 yards of fabric came from our local Dorell Discount fabrics…I bought everything they had (54 yards)…same with the suzani…just four yards. If you see something you like there, you better buy it as you can only reserve for a day. I just had a bad experience where they sold out of a charcoal linen that I had based a whole office around. I DO like to repurpose and to get a bargain! I love the new look in your dining room. 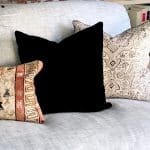 Suzani fabric maybe a trend, but it's one I happen to love and how brilliant to mix the black and white ticking for the detail with the solid linen on the reverse. I also love the mirror in your dining room—actually I love everything in your dining room! Love all the changes you made in "renewing" the living room of a friend. The herringbone fabric is beautiful…wow 52 yards and all the details to bring it current…all so pretty. I think I need to check out Dorell Discount fabrics! I love the sofa fabric…pretty and looks like it will hold up well! Love your dining room. And the fabric on the pillows is gorgeous. 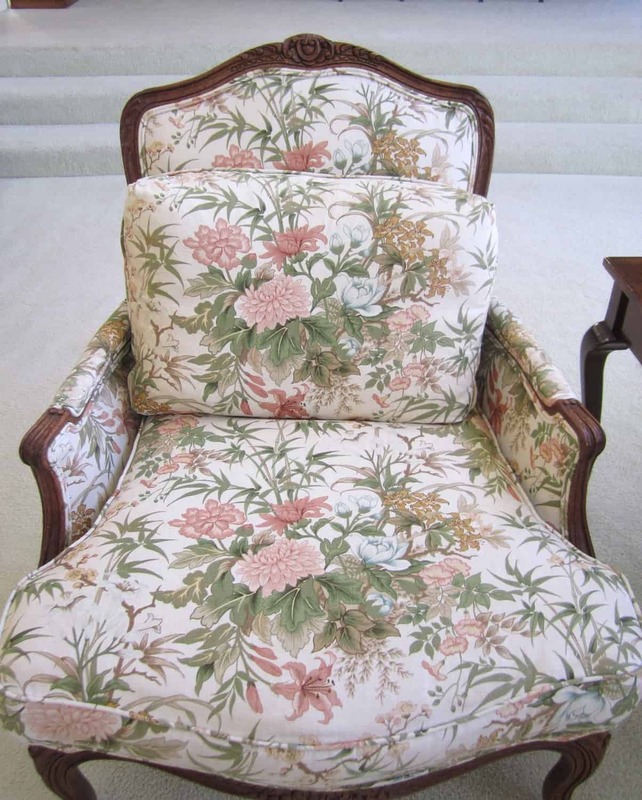 I have reupholstered over the years…and have been happy with it. Now everything I have is slipcovered which works really well for us when we want to change things around. So practical. gorgeous inspiration! found you via white wednesdays. come visit anytime! Maryann, Everything looks amazing. That sofa came out great. Where did you find fabric for 14.99! My gosh it looks fantastic. WOW I love that Suzani fabric! IT is fantastic…loving your dining room,and blog! Now following 🙂 Thanks for stopping by my blog. I love your newly recovered chairs! The pattern is so lively. I have a sofa that I'm dying to recover. I also like the herringbone fabric you helped choose for the sofa. I just persuaded a friend of mine to buy the same thing for her sofa. I'm feeling good knowing it you chose it too! 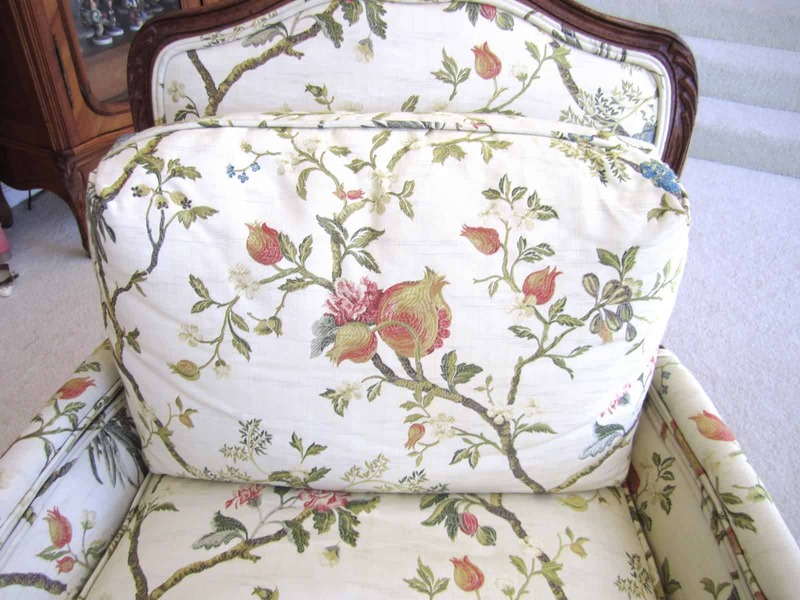 Do you do the upholstering or have it done? Just love the fabric that you selected for your new chair covers. That really add a zing to an already pretty room! Beautiful job! Love the suzani in the dining room and that ticking on the welt. I'm doing a some suzani print curtains and in ikat on some dining chair seats for a client in their traditional dining room now. Sometimes it's good to have a little bit of the trend in some fabrics. It instantly updates! the 'suzan' came out beautifully. i adore the pattern and the colorway that you chose. that is is one of the oldest persian designed patterns ever created. Love the process invloved in projects, room subject, fabric hunt, gathering elements in the space, round up for install and the reveal. 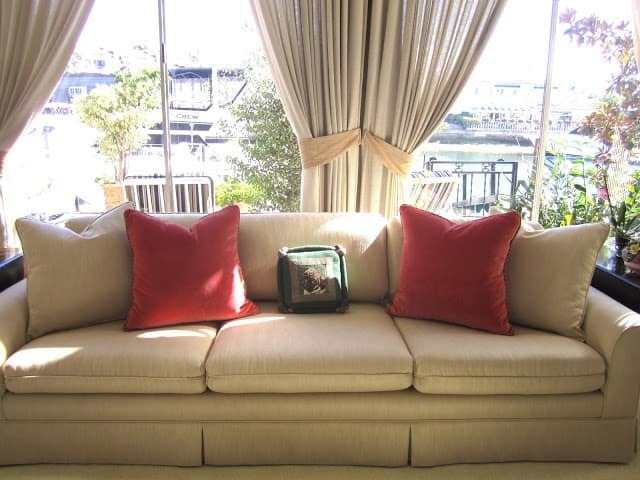 All projects start with the fabric don't you agree…really unifies the space. Love this post it is a perfect example of what is involved that most people don't realize happens…the simplicity of the process flow. The difficult part is the decision process and timeline. * I've listed your blog among those for "The Versatile Blogger Award" . We are influenced by all blogs we click over to and visit. I, too, believe in working with what is "there". Talent, imagination and some savvy shopping!! the fabric makes all the difference in the dining area- what an impact! Popping back in to thank you for joining the "room by room" series. What a brilliant way to try out a trend and make your chairs all work with one another. I also love the fabric you picked for your client's sofas. I love the new sofa…very sophisticated! I love everything! Refreshing and beautiful!